When simple, everyday fonts fail to give your words that extra oomph you want and need, then let FancyKey do the work for you! It’s the app that makes every word you type dance and jump off the screen. Free to download, it comes loaded with an incredibly unique and fun set of fonts that make every message you send mean so much more. The developers and designers at Pinssible Labs have taken their hardy and dependable FancyKey app and have enhanced it to provide users of various social media applications a new and unique set of cool fonts. Fonts that make every word they type and transmit carry added value. Simple fonts work great for informative pieces and essays, but for more dramatic and colorful communications, crazy formulations of letters grab attention and keep eyes glued to the screen. 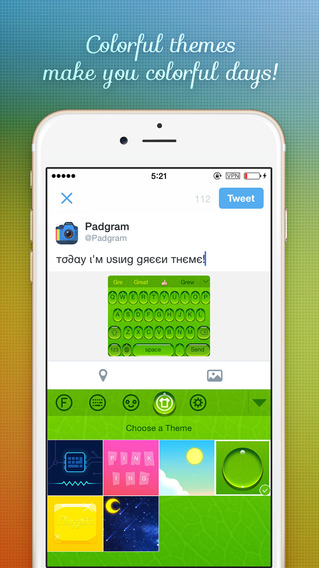 When you download this free fonts app, you get a wide variety of fonts. Some look like a new language altogether, but a closer inspection reveals their true identity to be some form of English, but in a new look and feel. There are also graphics of sorts made of the fonts that the app provides as well as cool emoji art integrated into the keyboard. These can be a fun way of sending a message, but as a picture of sorts. 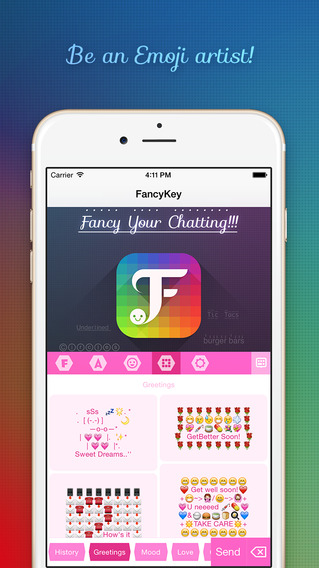 Just about anywhere you can type, you can use FancyKey. There is practically no limit to its applicability. A nice feature is the ability to mix fonts within a message. 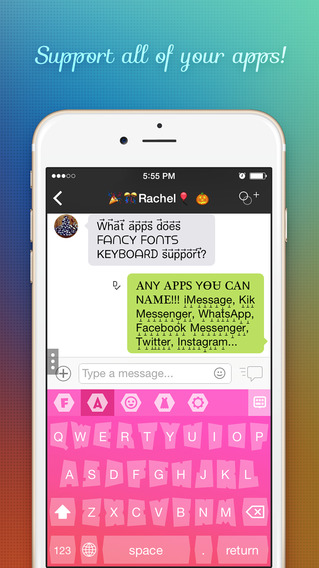 When the app is first downloaded, it seems so simple that one might assume it can only use one font per message. After a bit of experimentation, it is easy to see that they can be changed, although it can get tedious if you choose to mix it up too much. While it takes some getting used to, finding the keyboard and using the fonts, this app was quite enjoyable to use, but a bit mysterious at the same time. While you would want this type of an app to be available, but in a very subtle way, the subtlety can get confusing when you are looking for help on usage. However, a bit of experimentation and practice provides enough prep to becoming proficient. As a free app, it is definitely worth a download and trial to see what interesting messages and works of art you can create when choosing from the multitude of options made available by the app. Try them all out and find the one that suits you best for the types of message you frequently send, then see what kinds of reactions you get when you send your correspondence in style!